The Thruxton R is the third model launched in India from the new Bonneville range of Triumph. 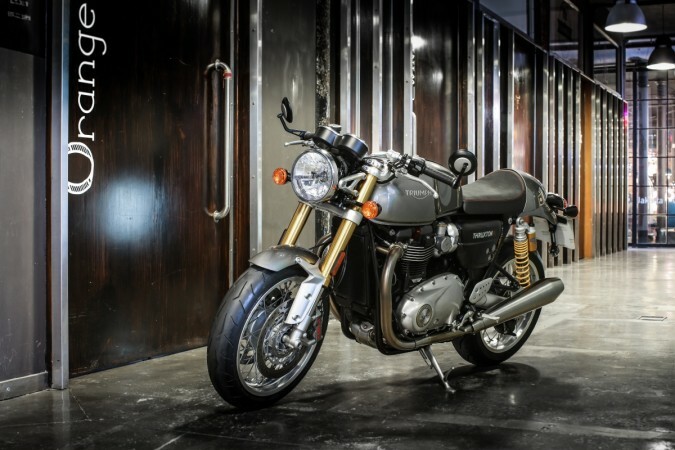 British motorcycle manufacturer Triumph launched the third model in its new Bonneville range â€” the Thruxton R â€” in India for Rs 10.9 lakh, ex-showroom, Delhi. The Thruxton R, which made its India debut at the Auto Expo 2016 in February, joins the other Bonneville models â€” the Street Twin and the Bonneville T120. The Thruxton R is powered by a 1,200cc parallel-twin engine that develops 96.5bhp at 6,750rpm and 112Nm of torque at 4,950rpm mated to six-speed transmission. Triumph claims the new power plant delivers 62 percent more torque than its predecessor. The engine is offered in three colours â€” Diablo Red, Silver Ice and Matte Black. Triumph Thruxton R comes with sporty ergonomics in line with the cafe-racer style. It features a clip-on handle with bar-end style mirrors, beefy gold-finish USD fully adjustable suspension and a 17-inch front wheel. It comes with a host of riding aids such as switchable ABS and traction control, torque-assist clutch, and ride-by-wire with three different riding modes â€” rain, road and sport. Other features include twin floating Brembo discs and Pirelli Diablo Rosso Corsa tyres. The Thruxton R will be import as CKD models and will be assembled in India. The company also said it has found over 3,000 customers via 13 dealerships across India in the past 30 months. The other two models in the Bonneville range the Street Twin and the Bonneville T120, priced at Rs. 6.90 lakh and Rs. 8.70 lakh, respectively (ex-showroom Delhi).